Jean and Sherryl are getting married. He is Afrikaans. She is Jewish. Their families are tense and Lukas - the best man - has been on a drinking spree and forgotten to confirm the band. In desperation he books the first available singer he can find - big mistake! Bianca is the bride's old nemesis and Sherryl's perfect wedding is quickly turning in to a tangled mess of emotion. Lukas needs to keep things together for the first time in his life and deliver the dream wedding for his two best friends, but he can't even find the ring. 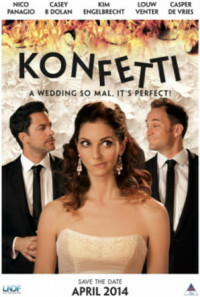 His attempts to keep the wedding on track and get these two to the altar are going make you laugh and cry. Regions are unavailable for this movie. Click the "Watch on Netflix" button to find out if Konfetti is playing in your country.